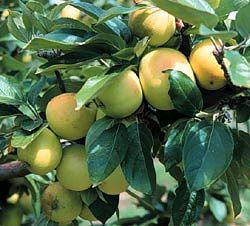 Michelin - Cider Apple Tree £12.75 - Cider Apples - Bittersweet Apple Trees and Fruit Trees For Sale. Buy at competitive prices with wholesale discounts. 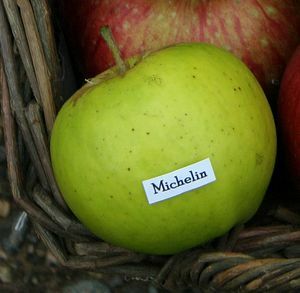 Michelin, a French import from the late 19th century, is now the most widely planted commercial cider variety across all regions, esteemed for its very reliable annual cropping. It tends to produce a tree of rather stiff, upright habit and can be difficult to train to a centre leader form, but spurring develops quickly and trees will start to crop early. Michelin will give good yields of medium bittersweet cider with soft tannins, and apples are ready to press by mid-October. Trees can be susceptible to canker in wetter parts of the U.K.